Quick-attach or pin-on, this tool is aimed at universal material moving chores. 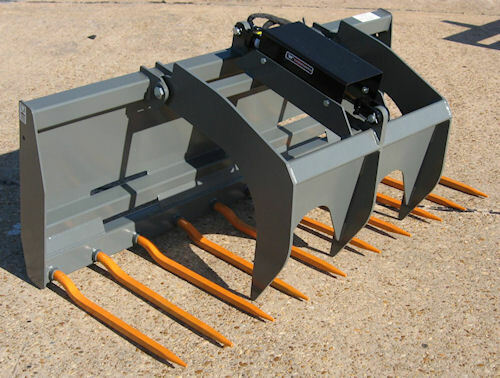 Loose debris such as straw, manure, brush, hay or other hard-to-get-a-hold-on materials can be moved easily with Worksaver's new universal forks. The units accept bolt-on interface brackets to mate with most pin-on or quick-attach loaders. Pre-cut slots in the back plate allow easy installation of the bolt-on brackets. All models feature forged cranked tines for improved efficiency and two of the models offer an upper grapple for securing larger loads. More information on the new material handlers is available from Worksaver, Inc., at www.worksaver.com. Or, call (217) 324-5973. Worksaver, Inc., is marketing a new universal manure/silage/debris fork for quick attach and pin-on applications.